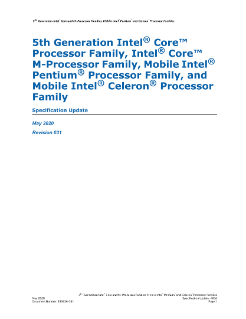 This document is an update to the specifications contained in the 5th Generation Intel® Core™ processor family, Intel® Core™ m-series processor family, Mobile Intel® Pentium® processor family, and Mobile Intel® Celeron® processor family datasheet. This document is a compilation of device and documentation errata, specification clarifications, and changes. It is intended for hardware system ...manufacturers and software developers of applications, operating systems, or tools.